Did you know that cake mixing ceremonies began in Europe in the 17th century? Extended families would get together, a couple of months before Christmas, to add rum and spices to fruits and nuts. The ceremony would signify the beginning of the harvest season, be considered a harbinger of good times, a symbol of the beginning of the joyous Christmas season and hope for an abundant harvest the next year. The mixed dried fruits and nuts would then be allowed to soak till the day before Christmas, when they would be baked into a fruit cake (commonly called ‘plum cake’ across India). Today, cake mixing ceremonies are held all over India, too, and have become times for people to get together and have some fun. At this time of the year, when there is barely a month to go for Christmas 2017, cake mixing ceremonies are underway at most high-end restaurants. Fruits and nuts are getting prepped to go into the XMas fruit cake. I was thrilled to be invited to the auspicious cake mixing ceremony this year at the Plaza Premium Lounge India, Bengaluru International Airport, recently, along with a bunch of other food and travel bloggers. Dried fruit and nuts, ready to be mixed and soaked! It turned out to be such a fun event, co-ordinated by Ankit Mangla, Executive Chef, Plaza Premium Group. All of us – including dignitaries from the Plaza Premium Group and the Bengaluru Airport – got our hands (errr… gloves) dirty and got busy mixing away. Uncountable bottles of alcohol and loads of fragrant spices went into the huge trays bearing dried fruits and nuts, and we mixed away to glory. Therapeutic it was, I tell you! It was a beautiful sight to behold as well. I hear the mixed fruits and nuts have been safely packed away in containers, where they will be allowed to soak until Christmas time. They will then be used to make plum cakes and other goodies for the Plaza Premium Lounge’s Christmas menu! The mixed fruits and nuts, all ready to soak away till Christmas! Post the event, we were treated to a lovely, lovely light lunch, courtesy of Chef Ankit Mangla. We were also offered a sneak preview of Plaza Premium Lounge’s Christmas-special! Let me tell you the pumpkin pie we were served was simply gorgeous, and the paan rasmalai was out of the world! (Psst: We had a look around the lounge as well, and it is simply brilliant – the lap of luxury!). A glimpse of the light lunch we were served at Plaza Premium Lounge. Top left: Assorted crackers and nachos with dips; Top right: The bread crocodile – isn’t he cute?! ; Bottom right: The fantastic paan rasmalai we were served; Bottom left: Pumpkin pies! My memories of winter are inextricably tied with Ahmedabad, where I grew up. There used to be a proper winter then, lasting about 3 months, with the weather turning a complete 360 degrees from the heat that engulfs the city most part of the year. Hands going numb with cold, razais and jackets coming out of their hiding in closets, monkey caps, and truckloads of winter veggies and delicacies – Ahmedabad goes the whole hog. There’s no ‘proper’ winter in Bangalore, where I live now. Oh, there’s a nip in the air and some beautiful days, but nowhere close to the mind-numbing cold that I have experienced back then. So, on chilly days like this in Bangalore, I try to rustle up a storm in my kitchen. I try to make the most of the winter veggies that Bangalore has to offer, try to relive those precious days from my adolescence. Fresh pigeon peas – tuver lilva or tuver dana in Gujarati, tuvarai in Tamil – is one of my favourite winter veggies. I love cooking with it, and one of my favourite things to make with these peas is Gujarati-style kachori. I think tuver lilva ni kachori, made with green peas and/or potatoes – are one of the bestest-ever things to eat during winters! Thankfully, the family loves them too, and I get an excuse to make them all the more often. You have to try these kachoris out to understand why I am raving so much about them. Do that, won’t you? Here’s how we make these Gujarati tuver lilva ni kachori, with the addition of green peas. First, prepare the dough for the outer shell of the kachori. Mix together the maida and whole wheat flour in a large mixing bowl. Add salt to taste and about 1 tablespoon oil. Adding water little by little, bind everything together into a soft dough. Cover and keep aside till you get the rest of the ingredients ready. Now, we will proceed to make the filling. Wash the pigeon peas and green peas well under running water. Pat dry using a cotton cloth. Coarsely crush them using a mixer. Just pulse the mixer twice or thrice, giving the ingredients a mix with a spoon in between. You don’t have to make a fine paste – just coarsely crush the peas. Heat about 1 tablespoon oil in a pan. Add mustard, and let it pop. Add in the crushed pigeon peas and green peas. Cook on medium flame till the raw smell of the peas disappears, about 2 minutes. Let this cool down completely. To the cooked and cooled peas, add salt and sugar to taste, asafoetida, lemon juice, garam masala (if using), raisins and grated coconut. Finely chop coriander and add to the peas. Chop ginger and green chillies, grind to a paste, and add this to the peas. Chop the cashewnuts and add to the peas. Add red chilli powder, if using. Mix well, taste, and adjust seasonings if needed. Keep aside. Now, we will make the kachoris. 1. Heat oil for deep frying in a large pan, till smoking point. 2. Meanwhile, get the kachoris ready. Make small balls out of the dough and roll one into a small circle. Spread the pea stuffing evenly over the circle, then close it. Seal the edges. Drop the prepared kachori into hot oil and lower flame to medium. Deep fry evenly on both sides, drain excess oil, and transfer to a serving plate. 3. Prepare all kachoris similarly. Serve them hot with spicy green chutney and sweet-and-sour tamarind chutney. Here is how I make the spicy green chutney that I serve with these kachoris. Here is how I make the sweet-and-sour tamarind chutney that goes beautifully with these kachoris. If you think the heat from the ginger and green chillies is good enough, skip adding the red chilli powder. You might even want to use more green chillies, depending upon your personal taste preferences. These kachoris can be made using pigeon peas (tuver lilva or tuver dana) entirely, skipping the green peas. If you want, you can even add in some potatoes, like I did here. These kachoris can be made plain and simple with a stuffing made of just pigeon peas, green peas, ginger and green chilli paste, asafoetida, mustard, salt, sugar, lemon juice and turmeric powder, with red chilli powder added in if needed. The garam masala, cashewnuts, coconut and raisins can be omitted, but they give a lovely flavour to the kachoris, so I personally wouldn’t recommend the omission. Typical Gujarati kachoris do have sugar in them, but you may leave it out if you want to. Again, that isn’t something I would recommend doing. You can skip the maida and make the kachoris with whole wheat flour as well. You like? I hope you will try out these kachoris at home too, and that you will love them as much as we do! This post is for the Foodie Monday Blog Hop. The theme for this week is ‘Winter Special Recipes’. You guys know how I’m in the process of discovering millets these days, right? Time and time again, on my blog, I have written about how I enjoyed cooking with millets. So, you can imagine how thrilled I must have been when I heard about this place called Prem’s Graama Bhojanam in Jayanagar, Bangalore, that serves mostly millet-based dishes. I just had to drag the husband, the bub and my mommy along to check it out. We absolutely enjoyed the experience, I must say. Located in the bustling Jayanagar area, in the 7th block, the eatery is quite easy to find. There is no space to park in the compound, so parking space must be found elsewhere. From the outside, the eatery looks like a beautiful village house, the entrance adorned with rangolis and rustic murals on the walls. Inside, too, the place is beautiful, again done up like a village house. There are rangolis on the tables, and food is served in good old-fashioned steelware. Sturdy plastic chairs make up the seating, and the lamp holders are made of cane, the kind of stuff you would find in a rural home. There are more rustic murals on the walls inside, giving the eatery an old-world charm. Left: Murals on one of the walls at Prema Graama Bhojanam; Right: That’s how water is served here at every table! I loved the way one wall of the main dining area has been decorated with steel utensils of all types. Another wall is done up with age-old Indian kitchen equipment like cane morams aka winnows. Shelves on one of the walls displays the various kinds of millets available to us. Prem’s Graama Bhojanam serves all-vegetarian, traditional, rustic Indian food, the food our ancestors grew up eating. Most of the dishes here are cooked using ingredients like millets, whole wheat flour and black rice, using healthy cooking techniques. Dishes like dosa, pongal, curd rice and bisi bele bath – which are usually made with rice – are made with millets here. This isn’t a fine-dine place, but a place that prides itself on not using any refined flour, preservatives, heavily processed ingredients, artificial flavours or colours or vanaspati. The place serves a variety of tiffin items for breakfast, every morning, and for tea time, every evening. Afternoons are, usually, reserved for full meals. Do plan your visit accordingly! I understand the items on the lunch menu keep changing every day. I am guessing the tiffin menu remains, more or less, the same every day. Prem’s Graama Bhojanam is owner NS Krishnamoorthi’s second venture, after a highly successful eatery operating on similar lines in Madras, by the same name. When we visited Prem’s Graama Bhojanam, it was lunch time. We chose from the menu available for the day. The sambar rice (with foxtail millet) and rasam rice (with barnyard millet) were a part of both thalis, and were very tasty and well made. The ragi mudde, that typical Kannadiga specialty, was well made as well. The palya we were served (made with greens and coconut) was simple and homely. The curd rice (made with little millet) was delightful. We absolutely adored the sweet served in both thalis, a halwa made with millets – it was just beautiful, with just the right amount of sweetness, redolent of ghee and edible camphor. None of us liked the daal much, nor the beetroot rice (made with kodo millet) that we were served – they weren’t bad per se, but could have done with more flavour. The water served at the eatery, in tall steel jugs, absolutely deserves a special mention here. Infused with the beautiful smells of tulsi and edible camphor, the water tasted and smelt like theertham from a temple. This all of us loved to bits. All the food was simple, with limited spices and greasiness, the way we would make them at home. The good quality of ingredients used to prepare the meal was evident. Definitely a plus point! Though everything was served in limited quantities, the thalis filled us up almost mid-way through eating – thanks to millets cooked the right way, I suppose. The food left us feeling light and energetic, quite contrary to the full and bloated way rice-based thalis full of spices and oil make us feel usually. After this hearty lunch, we ordered one of their famed matka kulfis, made with all-natural ingredients, sweetened with dates, figs and jaggery. The kulfi was so very beautiful, so well done, tasting pure and clean. It was the highlight of our lunch, if I may say so after that simple, clean and homely meal. When we reached the eatery, it was the peak of lunch rush and the place was buzzing with people. We were told that there would be a wait of about half an hour involved if we decided to lunch there, which we did. Within about 10-12 minutes, though, a table opened up and we were seated. Sadly, though, we were told there was no chair available for our little daughter, who, for lack of entertainment, rolled around on the floor and pulled at our clothes and what not. A small matter, but it would have been nice if this had been attended to – it would have gone a long way in ensuring that we had a nice, relaxed lunch instead of paying only half attention to it, the way we did. Otherwise, service was quite okay. The thalis arrived at our tables in about 10 minutes’ time, and everything was served hot. Price-wise, we felt the thalis were value for money, as was the matka kulfi, considering the good quality of ingredients used. We paid about INR 525 for the entire meal, which was pretty reasonable as compared to a whole lot of other eateries who serve sub-standard food and charge exorbitantly. We had a very delightful experience lunching at Prem’s Graama Bhojanam, overall, I would say. If I had to point out one thing that I would like changed about this place, I would say I wish they would serve at least a few tiffin items during lunch time as well. Not everyone wants to opt for a full thali at lunch time, me included, and I think the kids of some patrons would be happy to see some snacks. I can’t wait to go back to this place, this time at either breakfast or for evening snacks. 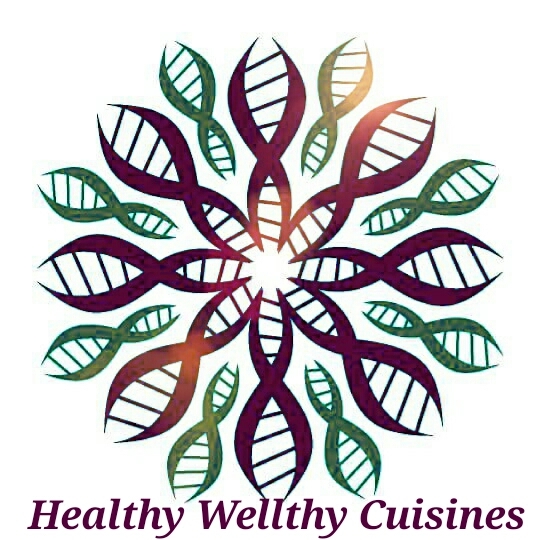 I am dying to try out their millet masala dosa, millet pongal, bamboo rice upma, black rice halwa, and the other unique but healthy delicacies on their menu! If you are looking for a place that will serve you hearty food which won’t harm you, without burning a huge hole in your pocket, this is it! Highly recommended! Do check out various millet-based recipes on my blog! Since this khichuri is commonly prepared as bhog, it is usually strictly vegetarian (niramish), with even onion and garlic being excluded. The moong daal is dry roasted till it emits a gorgeous fragrance, which is what gives this dish the name of Bhaja Muger Daal Khichuri (fried moong daal khichdi). Vegetables that we commonly use in pulao – carrots, green peas, potatoes and cauliflower commonly – go into the making of this Bhoger Khichuri, which has a sweetish tinge to it. I love how this Bhaja Muger Daal Khichuri is so very simple to prepare, a one-pot dish that takes just a few minutes to put together. I love how it is so hearty, so very satisfying, so very rich, thanks to the addition of the ghee and various spices in the garnish. I love how life enabled me to permanently bring home a slice of Calcutta with me. Now, let’s see how to make Bhoger Khichuri aka Bhaja Muger Daal Khichuri, shall we? Dry roast the moong daal in a pan, on medium flame, till it emits a lovely fragrance. Transfer to a plate and keep aside. Now, prep the veggies that you will need to make the khichuri. Peel the carrot and potatoes and chop them into cubes. Slit the green chillies length-wise. Chop the coriander finely. Chop the large cauliflower florets into half. Remove strings from the beans (if using) and chop into 1/2-inch pieces. Chop the capiscum into 1/2-inch pieces (if using). Peel the ginger and chop into small pieces, then pound them with a mortar and pestle. Keep the shelled green peas handy. Wash the rice in running water a couple of times. Drain out all the excess water, and place aside. Heat the ghee and oil in a pressure cooker bottom. Add in the dried red chillies, bay leaves, cinnamon pieces, cloves and cardamom, along with the asafoetida. Let the ingredients stay in for a couple of seconds, taking care to ensure that they do not burn. Now, add in the carrots, potatoes, cauliflower, green peas, capsicum and/or beans, along with the slit green chillies and pounded ginger. Saute on medium flame for a minute. Add the dry roasted moong daal and washed and drained rice. Saute on medium flame for a minute. Add in 6 cups of water, salt and red chilli powder (if using) to taste, garam masala, turmeric powder and sugar. Mix well. Mix in the finely chopped coriander leaves. Close the pressure cooker and put the whistle on. Pressure cook on high flame for 4 whistles. Let the pressure release naturally, and serve the khichuri hot. 1. Traditionally, Gobindobhog rice is used to make the Bengali bhoger khichuri. I didn’t have any, so I used Sona Masoori rice instead. 2. 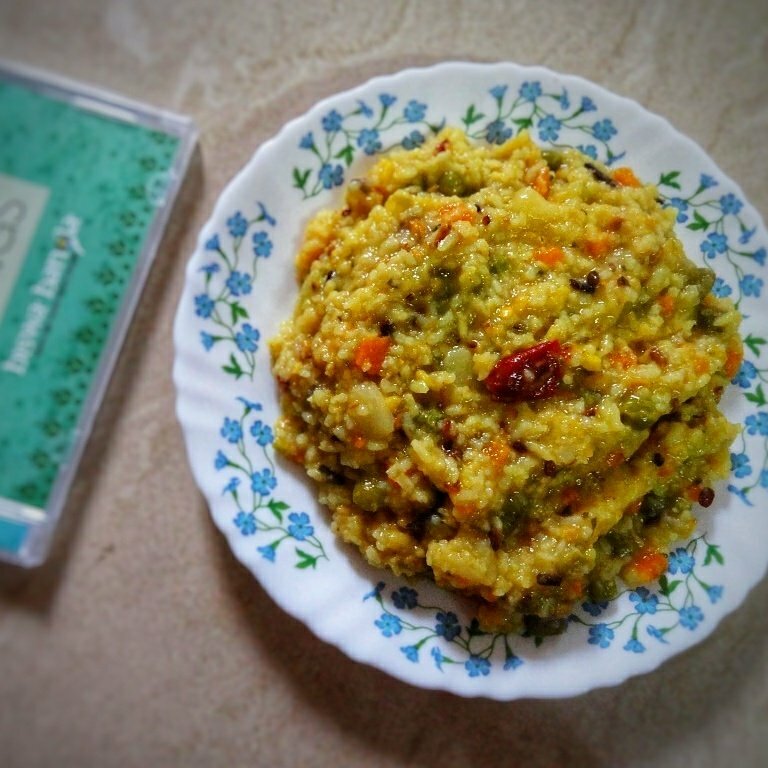 Carrot, potatoes, green peas and cauliflower are commonly used in this khichdi. Potatoes are an absolute must in Bengali khichuri. I usually add in some capsicum and/or beans as well. 3. I use a mix of ghee and oil for the tempering. Feel free to use only ghee, and vary the quantity depending upon your family’s taste preferences. 4. Omit the sugar if you want to, but I personally wouldn’t advise it. I think the sugar adds a beautiful flavour to this khichuri. 5. Bengali bhoger khichuri is traditionally made without onion or garlic, and I tend to omit these ingredients too. Feel free to add them if you want to. 6. Traditionally, almost equal quantities of moong daal and rice are used to make this khichuri, but I have used only 1/4 cup moong daal for 1 cup of rice. 7. Skip the red chilli powder if you think the heat from the green chillies and ginger would be sufficient for you. 8. If you want, you could soak the rice for about 20 minutes before setting about making the khichuri. I usually omit this step. 9. Whenever I can lay my hands on it, I use Jharna ghee from Calcutta to prepare this bhoger khichuri. That gives the dish an even more beautiful taste. 9. Traditionally, it is a must to dry roast the moong daal before making the khichuri. However, I often make the khichuri without roasting the moong daal, and it still turns out fabulous. 10. You can cook the khichuri with the veggies separately, and then add the tempering at the end. You like? I hope you will try out this khichuri too, and that you will love it just as much as we do! I am a big fan of the sweetish sambar that is served with vada, dosa and idli here in several Bangalore eateries. Having been brought up in Gujarat, the tinge of sweetness in the sambar appealed to me, and I fell in love with it the very first time I tried it out after shifting to Bangalore. It was much later that I got to know that this sweetish sambar originated in Udupi, a small city in the Karnataka, which is also famous for a number of other delicacies. When the Foodie Monday Blog Hop group chose ‘Recipes from Udupi’ as the theme this week, I thought it was only fitting that I write about this sambar that I so love. This is a recipe I have tried several times over, failed at, and then perfected. The secret, I’ve realised, is in grinding the sambar powder fresh, in very little batches, and grinding it well. If that is taken care of, and the toor daal is cooked nice and soft, this recipe (which I learnt from my aunt, BTW), works like a charm. So, here’s presenting the recipe for Udupi sambar aka Bangalore hotel sambar or tiffin sambar. First, we will get the spice powder ready. Heat the 1 teaspoon of oil in a heavy-bottomed pan. Reduce flame, and add in the chana daal, urad daal, coriander seeds, fenugreek, dried red chillies and cumin. Roast on medium flame till the daals turn brownish in colour and begin to emit a nice fragrance. Stir constantly, and take care not to burn the ingredients. The roasting should take 3-4 minutes. Add in the grated coconut. Mix well. Roast on medium flame for 2 more minutes, stirring constantly. Ensure that none of the ingredients get burnt. Transfer the roasted ingredients to a plate. Let them cool down completely. When the roasted ingredients have cooled down fully, grind to a fine powder in a mixer. Keep aside. Now, we will boil the toor daal. Wash the toor daal a couple of times in running water. Drain out all the water. Take the toor daal in a wide vessel, and add in just enough water to cover it. Pressure cook the toor daal for 4-5 whistles. It should turn very mushy. When the pressure has gone down completely, mash the cooked toor daal. Keep aside. Now, we will prep the tamarind. Place the tamarind in a little vessel and add a bit of water. Place on medium flame. Let the water come to a boil, and switch off gas. Let the tamarind soak in the boiling water till it is cool enough to handle. Then, extract a thick juice from the tamarind, adding a little more water. Keep the extract aside and discarded the used tamarind. Now, we will go on to prep the veggies you will need to make the sambar. Chop the onions length-wise or finely, as you prefer. Keep aside. Peel the carrot and chop into batons or cubes, as you prefer. Keep aside. Chop the tomatoes into small pieces. Keep aside. Keep the shelled green peas and curry leaves handy. Chop the coriander finely, along with the stalks. Keep aside. Proceed to make the sambar now. Heat 1 teaspoon of oil in the same pan you used to roast the spices. Add the mustard, and allow it to splutter. Add the asafoetida and the curry leaves. Let them stay in for a couple of seconds. Add the chopped onions. Saute on medium flame for a couple of minutes, or until they turn brownish. Add the green peas and the carrot. Cook on medium flame, till the carrots are done. Sprinkle some water at regular intervals, if needed. Now, add the chopped tomatoes and the tamarind water. Cook on medium flame till the raw smell of the tamarind goes away, and the tomatoes turn slightly mushy. Add the cooked toor daal and 2 tablespoons of the sambar powder (or to taste) we made earlier. Also, add 1 cup water, salt, jaggery and red chilli powder to taste, as well as the turmeric powder. Mix well. Cook on medium flame till the sambar comes to a boil. Then, lower flame further and let the sambar simmer for a couple of minutes more. Taste and adjust spices/salt if needed. Switch off gas. Serve hot with idlis, vada or dosas. 1. I used the veggies that I had on hand. You can use any other veggies you want to. White pumpkin, capsicum and brinjals are some vegetables that go well in this sambar. 2. A Karnataka-special type of dried red chillies called Bydagi are usually added to the sambar in hotels, which is what gives it a deep brown colour. The colour of my sambar is different because I have used ordinary dried red chillies. The Bydagi does not have much heat, so if you plan to use them, you might want to mix them with some other variety of hot dried red chillies. 3. Dried coconut can be substituted for fresh grated coconut, in the spice mix. 4. I used refined oil to make the sambar. Using coconut oil instead would add in a lot more flavour. 5. Leave out the cinnamon from the spice mix, if you want to. I personally like it. 6. The jaggery is optional – add it only if you want to. In Karnataka hotels, jaggery is very much present, though. 7. If your dried red chillies are spicy enough, you can skip the red chilli powder. 8. Ensure that the spice powder is ground well and that the toor daal is well boiled and mushy, for best results. 9. The above measurements yields about 1/2 cup of sambar powder. The sambar, as stated above, needs only about 2 tablespoons of the powder. Store the rest in a clean, dry, air-tight box and use within 7 days or so. This sambar powder is best used fresh. 10. Use more toor daal if you want a thicker sambar. 1/4 cup of toor daal works out just perfect for us. 11. Some people add a few black peppercorns to the spice mix. I usually avoid that. You like? I hope you will try out this Udupi sambar aka Bangalore hotel sambar or tiffin sambar, and that you will love it, too! This recipe is for the Foodie Monday Blog Hop. The theme for this week is ‘Recipes from Udupi’. With the kind of beautiful gooseberries you get in the market these days, it would be a sin not to pickle them! I absolutely had to get some home and make this nelikkai urugai aka amla pickle. There’s something charming about old-fashioned, home-made pickle. It adds a very special touch to ordinary meals, I think, specially so if it is made with seasonal produce like this. This gooseberry pickle adds life to a bowl of curd rice, and spices up roti-sabzi like very few other things can. Try it out! Here is the very simple way in which we make gooseberry pickle in our family. 1. Wash the gooseberries and pat dry with a cotton cloth. Place them in a vessel. 2. Take about 1 cup water in a pressure cooker bottom, and place a stand on it. Place the vessel with gooseberries on top of the stand, to ensure that no water will enter it. Close cooker and place on gas. Pressure cook on high flame for 5 whistles. Let pressure release naturally. 3. Dry roast 1 teaspoon mustard and 1/2 teaspoon fenugreek in a pan on medium heat, till they slightly change colour. Ensure the ingredients do not burn. Transfer to a plate, and let the ingredients cool down completely. 4. When all pressure from the cooker has been released, remove the gooseberries onto a plate and let them cool till they are cool enough to handle. Press the gooseberries slightly, and they will separate into segments. Discard the seeds, and place the segments in a large mixing bowl. 5. In a mixer, grind the roasted mustard and fenugreek into a powder. Spread this powder evenly over the gooseberry segments in the mixing bowl. 6. Add salt and red chilli powder to taste, asafoetida and turmeric powder to the gooseberry segments in the mixing bowl. 7. Heat the oil in a pan and add 1 teaspoon of mustard seeds. Let them splutter. Switch off gas, and add the curry leaves. Let them stay in for a couple of seconds. Now, add the hot oil with mustard and curry leaves to the mixing bowl. 8. Mix the ingredients in the mixing bowl gently with a clean, dry spoon. Let the pickle cool down completely before transferring to a clean, dry bottle. Keep the bottle at room temperature for a day, and then in refrigerator. The nelikkai urugai aka gooseberry pickle stays well for 6-7 days. Make sure you keep a stand in the pressure cooker, below the vessel you place the gooseberries in. This will ensure that no water comes into contact with the gooseberries, which helps in improving the shelf life of the pickle. Choose fresh gooseberries that are firm, without any dents or spots. Some people omit the curry leaves, and you could do the same too. I like adding them, though. This nelikkai urugai aka amla pickle is ready to be consumed the day after you make it. That is when the spices have soaked quite a bit into the gooseberries, softening them further. Use only a clean, dry spoon whenever you consume the amla pickle. A dash of jaggery can also be added, to enhance the taste of the nelikkai urugai. You like? I hope you will try out this nelikkai urugai (gooseberry pickle/amla pickle), and that you will love it, too! Did you know that the Brazilians make lemonade using condensed milk, and that it tastes extremely delicious? I didn’t, until I recently saw a post about it on Pinterest. And then, I HAD to try out this hatke (at least for me!) version of lemonade for myself. The original Brazilian lemonade is made with limes that are very commonly available there. Whole limes are placed into a food processer, along with condensed milk, and the result is a delectable lemonade! Now, I have no access to Brazilian limes, so I used our very own Indian lemons instead. Instead of grinding the lemons whole, I used just the juice and the zest. The end result was super-duper fabulous! The ‘Brazilian lemonade with Indian lemons’ tasted so, so, so awesome! It is the husband and my new favourite drink. Making this version of Brazilian lemonade is quite easy, as easy as saying 1-2-3, a task that will not take you more than 10 minutes. Do try it out! Here’s how I made the lemonade. Place the condensed milk, lemon juice and zest in a mason jar. Mix well, using a spoon. Add in chilled water to the brim. Mix again. Taste and adjust ingredients if required. Serve immediately. Use ice cubes if needed. You can also use half the quantity of condensed milk suggested here. In that case, you might want to use more chilled water and add in some powdered sugar or sugar syrup. Let your taste preferences dictate the quantity of lemon juice, condensed milk, lemon zest and water that you use. The above quantity worked out just perfectly for us. Alcohol can be added to this lemonade as well, if you want to. So can coconut milk. For best results, use ripe, juicy, yellow Indian lemons with a thin skin. Zest from unripe green lemons might make the drink bitter. See? Told you it was easy-peasy! I hope you’ll make this Brazilian lemonade too, and that you will love it as much as we did! I absolutely adore cooking with curd and buttermilk. Be it Gujarati kadhi or Punjabi, ras no fajeto or more koozhu, shrikhand or a bowl of chaaswala mug, I love them all. So, when I recently saw this recipe for khichdi cooked in buttermilk on the very talented Aruna’s food blog Aaharam, I knew I absolutely had to try it out. It had my name written all over it, and I knew I was going to love it. When the Foodie Monday Blog Hop team fixed the theme for this week as ‘khichdi‘, I was very clear that I wanted to try out a buttermilk-based khichdi like the one from Aruna’s blog. And that is just what I did. The result – a moong daal vegetable khichdi in buttermilk – was very much loved by everyone at home. The taste was absolutely fantastic! I so know this is going to be the new comfort food for us. Besides, it is a great way to use up leftover buttermilk as well. What’s more, this is a one-pot dish that can be cooked in a jiffy! This is how I made the moong daal vegetable khichdi in buttermilk. First, we will prep the veggies that you need to make the khichdi. Finely chop the onion and coriander. Chop the beans, capsicum and carrot into 1/2-inch pieces. Slit the green chillies length-wise. Coarsely crush the garlic with a mortar and pestle. Keep the shelled green peas and sweet corn handy. Keep aside. Wash the rice and moong daal well under running water. Place in a colander, and let all the excess water drain out. Heat the oil in a pressure cooker bottom. Add in the mustard seeds, and let them splutter. Add the cumin and asafoetida, and let them stay in for a couple of seconds. Now, add the chopped onion, beans, capsicum, carrot, sweet corn, peas, slit chillies and crushed garlic. Saute on medium flame for 1-2 minutes, stirring constantly. Add in the washed and drained rice and moong daal, along with salt to taste and the turmeric powder. Mix well. Saute on medium flame for a minute. Keeping the flame medium, add in the buttermilk and chopped coriander. Mix well. Close the pressure cooker and put the whistle on. Pressure cook on high flame for 5 whistles. Let the pressure release naturally. Serve hot. Increase or decrease the quantity of red chilli powder and green chillies you use, depending upon how spicy you want the khichdi to be. The buttermilk you use should not be too sour. It should be of the right consistency – neither too thick nor too thin – for best results. Make sure the flame is set at medium while you add in the buttermilk. This will help stop the buttermilk from curdling. You could cook the khichdi in 3 cups of slightly thicker buttermilk and 2 cups of water, as well. Personally, I think the 5 cups of buttermilk works best for us. You could add any other veggies that you want to. I used the veggies that I had handy in my kitchen. You could use just green chillies in the khichdi, and skip the red chilli powder entirely. If you want, a dash of garam masala/chana masala and/or sugar can be added to the khichdi. You like? I hope you will try out this moong daal vegetable khichdi in buttermilk, and that you will love it just as much as we did! This post is for the Foodie Monday Blog Hop. The theme for this week is ‘khichdi‘ (an in-trend theme, considering how the humble khichdi has been much in the limelight in India lately! ).